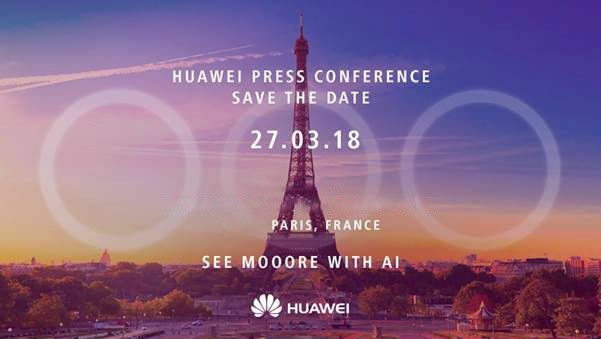 Huawei may have just announced the Mate 10 Pro at CES last month, but the company is already gearing up to launch its next major device, the P20, at an event in Paris on March 27th. If the invite for the event is anything to go by, it’s possible that the P20 will be the first major smartphone to feature a triple-lens rear camera system, via Android Central. Rumors have already been swirling that the P20 would feature a three-lens system, and the invite — with a ghostly “OOO” motif and the phrase “See mooore with AI,” — would seem to reinforce that theory. The company is rumored to be launching three devices at the event: the P20, the P20 Lite, and the P20 Plus. It’s still unclear whether the triple-camera system will be coming to all three devices or not. Also unknown is what Huawei will actually be using the third camera for; typically, dual-camera systems either have a black-and-white and a color lens, or a standard lens and a telephoto lens. Other rumors from leaked ads in December claim that the flagship P-series will use the triple-lens system for 40-megapixel stills with 5x zoom, so it could just be to enable multiple levels of optical zoom. Still, in today’s marketplace, where it's often hard to make devices stand out from each other by virtue of specs alone, maybe a third camera will give Huawei the boost it needs to make a splash. The Moto G5S Plus is one of the most balanced phones Motorola has on offer and it's selling at a really attractive price. Now that we finally got round to reviewing it, that is. Oh well, our timing isn't spot on but the package and the price are.